The 1000 Books Before Kindergarten Challenge organizers were recognized with the Breakthrough Guru award during the Summit on Government Performance and Innovation held February 11-12, 2015. Join these Gurus in promoting the this great program and increasing our community's literacy and education readiness. Watch this video from Metro TV and visit the Library's website for more information about the 1000 Books before Kindergarten Challenge! In need of some summer reading? The Bon Air Branch Friends Group is having a book sale! Monday, July 20th 2:00 pm to 8:00 pm. 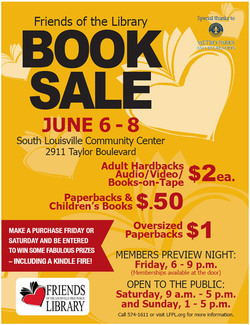 The Book Sale will include an ice cream social and lively swing music by “Swingboat" from 6:00 to 8:00 pm. $4 for a bright green book bag (donation to Bon Air Friends) to easily carry home your purchases. ﻿﻿Email﻿﻿ or call us for more information. Our email ﻿address﻿ is info@friendsofthelfpl.org and our phone is 502-574-1648.